This is not just a charity, but a creator of sustainable social businesses. The Beauty+ Network does so much more than just provide beauty training – we link our students to the knowledge and people they need to succeed before and after they graduate. We connect our students with successful graduates, beauty professionals from around the world and other supporters through our School, our Network and our Salon. The Beauty+ Network looks to build sustainable networks that grow organically in every country it operates in. 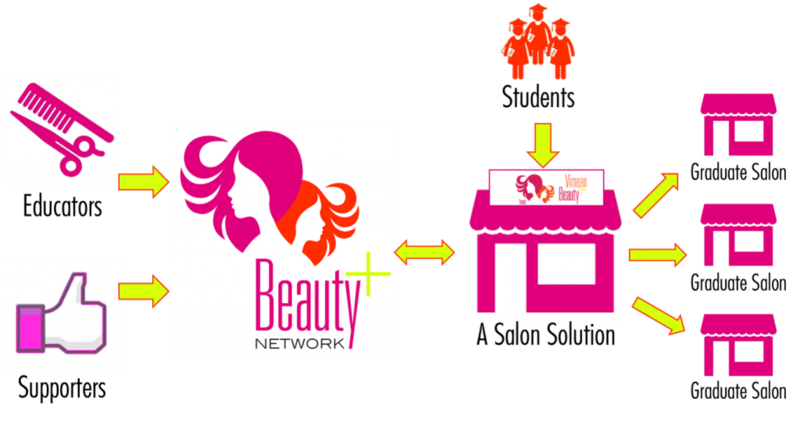 The Beauty+Network Solution lets our graduates shape the future of beauty in their country! We have four phases of development, from establishing the initial solution to opening our flagship salon in a developed market. Our vision is to create more financial independence and open more opportunities for women through beauty. From our first program in Siem Riep, Cambodia, 3 students have started their own Beauty+ affiliated salon and hired Beauty+ School graduates as employees, while another 8 operate their own separate salon businesses or work in another salon.